As a bit of fun, inspired by my kids' current addiction to Pokémon Go, I've added a "Beacon" feature to #ReallySimpleMovingMap. This enables you to share your current location with your Twitter followers. Simply open #ReallySimpleMovingMap in your browser (with Location services enabled/authorised for the web-app), and click the "Beacon" button (lower-right of main page). This will give you the option to navigate to Twitter with a pre-cooked Tweet containing your current location (latitude and longitude) encoded in a URL. If you send that Tweet, your followers can click on the embedded link in the Tweet which will take them to #ReallySimpleMovingMap opened on your current position. 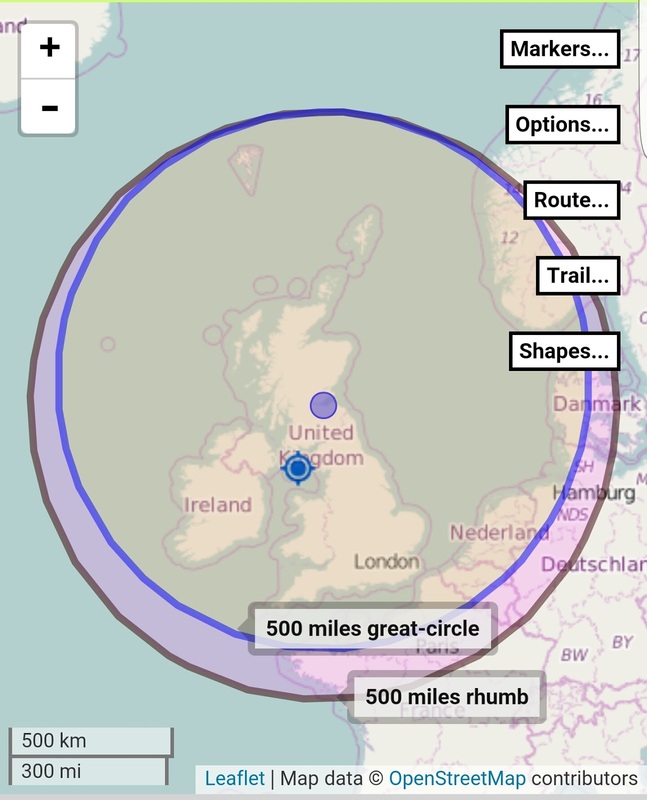 A while ago an image was doing the rounds on social media which showed a circle with radius of 500 miles centred on Leith, thereby depicting the possible search area covered by the Proclaimers in their (rather excellent ) "500 miles" . As is often the case one sees with shapes drawn on maps, the circle was drawn as a pure geometric circle superimposed on a Mercator map projection. This is of course easy to do, but is misleading: strictly speaking, that pure shape suggests that all the radial lines would be Rhumb-lines (i.e., straight lines drawn on a Mercator projection). Although it looks like a circle, it really isn't: when drawn on the surface of a sphere (or more accurately, an ellipsoid) representing the Earth's 3D geometry, that simple Rhumb-line circle would be distorted. Instead, a circle drawn on the surface of the sphere (or ellipsoid) should be constructed from radial lines which are arcs of Great Circles rather than Rhumb-lines (note: such a circle, constructed from Great Circle arc radii, is actually called a Small Circle). The aforementioned distortion is greater for larger circles: but even at 500 miles radius, it is evident. The image below illustrates the point. The two "500 mile circles" are depicted: the one constructed from Rhumb-lines (which actually looks like a circle on this Mercator projection map), the other from Great Circles (which is actually distorted on the map, but would look like a circle when viewed on the surface of an ellipsoid). Both are centred on Leith (near Edinburgh, Scotland). Since distances aren't preserved under projection, I have (arbitrarily) set the northern-most point of each circle to be in the same location (at 500 miles along a Great Circle from Leith). All other points on the two shapes are different. In terms of perimeters and areas, the Rhumb-line derived circular shape is larger: perimeter 5,639 km; area 254,3000 sq-km, versus perimeter 5,038 km; area 202,8000 sq-km for the Great Circle derived shape. So, assuming The Proclaimers walk along Great Circles in their quest, they will cover a smaller area of land than if they simply drew a circle on a map and used that to navigate. I've used this "500 miles" example to demonstrate the (new) Shapes functionality I've just released within my #RSMM (#ReallySimpleMovingMap) web-app. All visual attributes of the shapes can be customised e.g., line color & opacity, line thickness, fill colour & opacity, etc. Export the shapes (individually or in groups) to KML file format (sent by email) for ease-of-use with KML-supporting apps such as GoogleEarth.